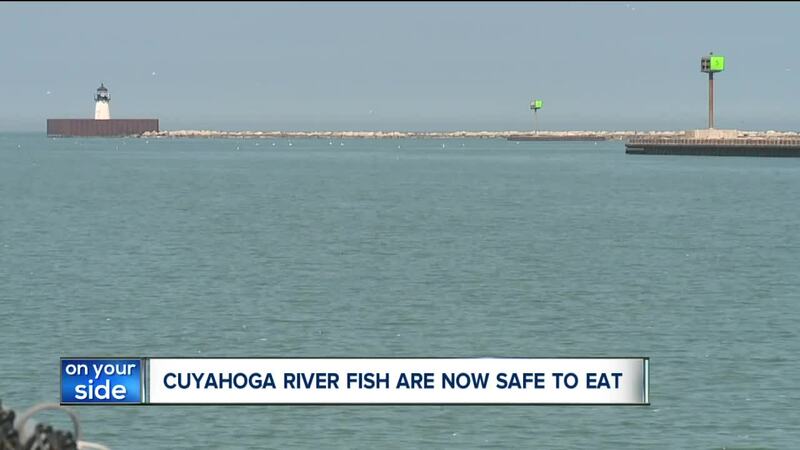 CLEVELAND — Three months shy of the 50th anniversary of the Cuyahoga River fire, the United States Environmental Protection Agency has determined fish that call the river home are now safe to eat. The watershed, which was listed as an ‘area of concern’ in 1987, includes nearly two dozen creeks and roughly 10 miles of Lake Erie shoreline. On June 22, 1969, the Cuyahoga River famously caught fire. However, it was neither the first fire nor the worst fire the river has experienced. The 1969 blaze drew national attention, eventually becoming the impetus for environmental regulation that still exists today, including the creation of the EPA as well as the passage of the Clean Water Act. Governor Mike DeWine lauded the easing of fish consumption restrictions, saying it is an important step toward ultimately removing the river altogether as an area of concern. The EPA’s decision is a living testament to the decades’ worth of work and billions of dollars spent on water and sewer infrastructure in recent years, said Julius Ciaccia, the chairman of the Cleveland Water Alliance Board of Directors . Ciacca is also the former CEO of the Northeast Ohio Regional Sewer District, which was also born out of the 1969 Cuyahoga River fire. The U.S. EPA agreed with Ohio EPA’s recommendation that restrictions on fish consumption be eased from Gorge Dam near Akron to Lake Erie in Cleveland. State regulators proposed the change last year judging by improvements observed through fish tissue sampling. Although the fish are safe to eat, they should only be consumed in moderation. Brown bullhead, carp and catfish found in the river fall under the same standard as those who are caught in the lake. The state recommends one meal per month. This is the third "beneficial use impairment" that has been removed by the EPA since late 2017. The Cuyahoga Area of Concern Committee has seven other impairments it is working to rectify. Those impairments include: degradation of fish habitat, degradation of fish populations, unwanted algae, occurrence of fish tumors, degradations of benthos, restrictions of navigational dredging and beach closings.